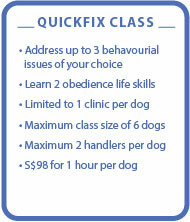 Smartdoggy Quickfix Clinics (SQC) are weekly behaviour group clinics focused on helping owners to sort out their doggy issues. As a bonus, dogs will learn new obedience skills. Complete the form below and we will be in touch shortly with confirmation details. Please register early to avoid disappointment. Check out our other Canine Classes!